There are three items in my kitchen I think I’d be lost without. I drink a lot of coffee and swear by my tassimo coffee machine and then there is my T-fal OptiGrill Electric Grill (Seriously, this thing rocks) Then there’s my ninja blender. Did you now that thing will pulverize anything..even those little wire mixing balls that come in your water bottle. There was life before these kitchen gadgets, just as there’d be life after. But they do add an extra layer of joy and comfort to my daily routine- and i’m not the only one who geeks out about their tools. My husband is just as bad if not worse than I am. As the main cook in our family, I spend quite a bit of time in the kitchen. We have knives and peelers and juicers… but there is a whole category of kitchen gadgets which I never even know existed! Gadgets you never even knew existed and didn’t think you needed until you found them. I mean a lemon peeler.. how in the world would we have ever peeled our lemons! But when you cook a lot, like I do those really specific, how-often-are-you-actually-going-to-use-that items are often the most useful. You never know when you’re going to need to pit a bunch of cherries for a recipe! Over the years I have found that I still don’t have everything I need to make my kitchen run as smoothly as it should and, between myself and my husband we are always adding to our stash of kitchen gadgets. So here are my top 7 kitchen gadgets you didn’t know you need. Why you need it: If you have a regular blender, you might think that you don’t need an immersion blender. I thought this for a while, until I got one. You know how when you make a pureed soup, you have to wait for it to cool down and then pour it into a blender? And then when you’re done, you have the blender to clean in addition to the big soup pot? No more! With an immersion blender, you can just stick it in the soup pot and avoid the whole blender mess. And I love using mine to make smoothies too. When our big blender broke, we didn’t even bother replacing it because we use the immersion blender so often. Why you need it: No matter how careful I try to be, when I make pasta, the water boils over. It’s just a given. And that burnt on scalded water is such a pain to clean up. There are already a few parts of our new electric range that seem to be ruined from boil-over. This lid catches that water overflow–it’s ingenious! Why you need it: Okay, I know: you already have a can opener. Why would you need another? Well, because this is a superior can opener! After going through can openers every few months, I decided to try this one–that was 5 years ago and it’s still going strong. And apart from its sturdiness, what I love about it is that it slices off the entire top of the can, not just that inside part. There are no sharp edges to cut yourself on and the (dirty!) can lid doesn’t fall into the food. Fishing the lid out of the soup is but a distant memory for me now. Why you need it: This is one of those tools that you will probably only use a few times a year, but when you do need it, you will be so grateful that you have it. (And for $13, this is definitely worth the investment!) Seriously, if you’ve ever spent an hour pitting olives by hand for a recipe, you need one of these. Why you need it: When I watch cooking shows on TV, they always make mincing herbs look so easy. But when I do it in real life, the herbs stick to the knife or don’t end up getting cut. It’s not like I can’t do it, but it’s not that 5-second operation like they show on TV. I love my herb mincer because you simply roll it over the herbs a few times and you’re done. Why you need it: Garlic peel is such a pain to remove. This tool makes it so much easier–just put the clove in the tube, roll it around inside, pressing gently, and the peel comes off. Why you need it: You know what annoys me? Recipes always call for a few tablespoons of parsley or cilantro, but grocery stores sell it in huge bunches. And then those bunches go all icky and slimy after they’ve been in the fridge for a few days. With an herb saver, you can keep those herbs fresh for up to 3 weeks. It’s the next best thing to growing your herbs yourself. Whats the most important thing in your kitchen? 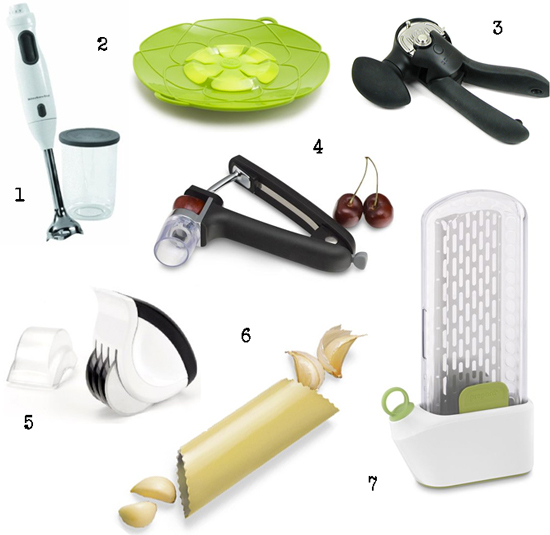 What kitchen gadget would you add to the list? « Butternut squash fries you and your kids will love! These all sound incredibly handy. Immersion blenders are great tools to have around. I think I might need an herb saver! I definitely need the blender and garlic peeler. My birthday is coming up, I need to start hinting to my husband. I never knew a lot of these gadgets existed! Now I need to figure out what I should add to my Christmas list for this year! You’re so right, I didn’t know that I needed any of those things. I still think I might not need them but they sure are good to have. I love tools that make everyday jobs easier. I think the garlic peeler is my fave! Well you just made holiday shopping a bit easier for me. My spouse loves to cook and I plan to pick up at least 2 of the items on this fab list. You know that pitter would actually come in handy for so many recipes. I never think about tools like that when I go shopping though. Ooh, you’re right. How have I lived without those for so long? Need to go shopping right now! I do believe you just made my Christmas list for me this year. I am loving these kitchen gadgets. I love kitchen gadgets!!! Just got a new one today….a salad spinner!!! Can’t wait to use it!! I did not even know most of these gadgets even existed! I have the can opener which is a must! Interesting list. The immersion blender is on my list and I’ll have to look into that garlic peeler. I would add a spiralizer. It’s kind of gimmicky, but it makes eating veggies more fun for kids along with making it easy to replace pasta with low carb healthy options. I’ve had so many bad can openers in my life, that I’m a believer! I’m also not sure where we’d be without our immersion blender and garlic peeler. Me too!! I had to replace my last one because I ended up with 4 stitches in my finger because it didn’t work properly. I love my KitchenAid Immersion Blender! I make homemade tomato soup and it’s nice to not have to mess with a traditional blender to get it nice and smooth.